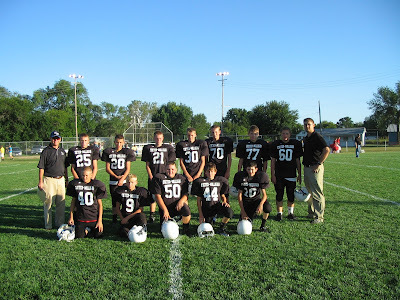 Front Row: (left to right) Kyle Jindra, Trevor Luzum, Kirby Soukup, Elliot Erdkamp, Evan Harre. Back Row: Head Coach Brian Murphy, Brayden Olsen, Sean Maxson, Sam Zeleny, Jack Dinneen, Cameron White, Spencer Papik, Johnathon Mounce, Assistant Coach Jordan Marr. 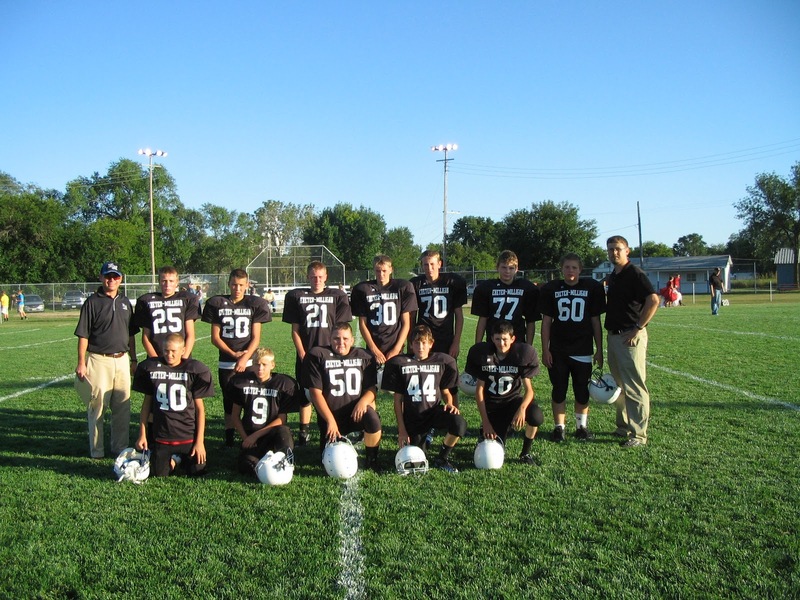 To open the season, the Exeter-Milligan junior high football team hosted East Butler on September 13. On the opening drive, E-M drove down the field on a five-minute drive. The drive ended with Sam Zeleny hitting Sean Maxson on a 17 yard pass for a touchdown. Maxson added the two point conversion. E-M held an 8-6 lead at the end of the first quarter. East Butler added a touchdown in the second quarter, while holding E-M scoreless. Both defenses remained tough in the third quarter, with neither allowing a point. With the score 16-20, East Butler converted a crucial fourth down pass, that was tipped by two E-M defenders, with just over two and half minutes remaining in the game. Zeleny ran for touchdowns of 8 and 20 yards in the fourth quarter. Jack Dinneen added a two point conversion. The only turnover by East Butler was a fumble recovered by Cameron White. The final score was Exeter-Milligan 22, East Butler 28. On September 19, Exeter-Milligan hosted Friend in another close game. Exeter-Milligan was down by just two points, 12-14 at the half. Jack Dinneen scored for E-M in the first quarter on a 44 yard end around run. In the second quarter, Sean Maxson had a 4 yard touchdown run. E-M scored once more late in the game on a 15 yard run by Elliot Erdkamp. The two point conversion pass from Sam Zeleny to Brayden Olsen completed the E-M scoring. Defensively, Dinneen recovered a fumble for E-M. The final score was Exeter-Milligan 20, Friend 36.